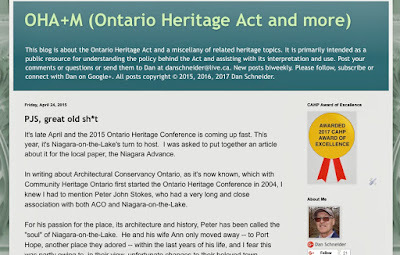 OHA+M (Ontario Heritage Act and more): The blog takes a bow! The blog takes a bow! Today, it’s all about the blog. I don’t often get to toot my own horn, but … drum roll please. 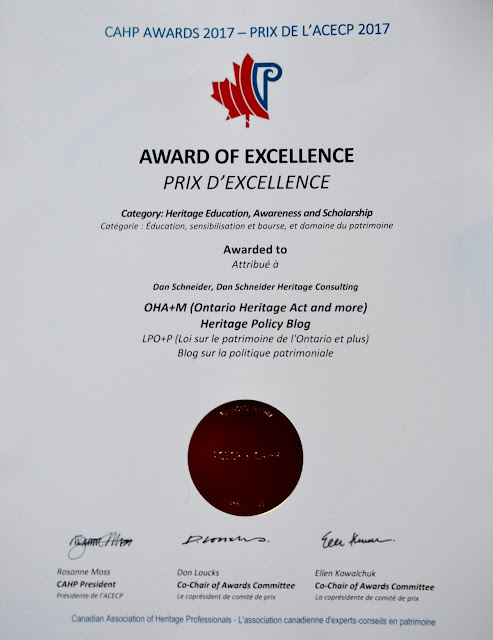 At the joint National Trust for Canada and Canadian Association of Heritage Professionals awards ceremony in Ottawa last month, I received an Award of Excellence for the blog in the Heritage Awareness, Education and Scholarship category. It is a great honour and pleasure to have been recognized by CAHP with this award. For those curious about how the blog came to be, here is the story. OHA+M was launched in the depths of February 2015 — Heritage Week to be precise. 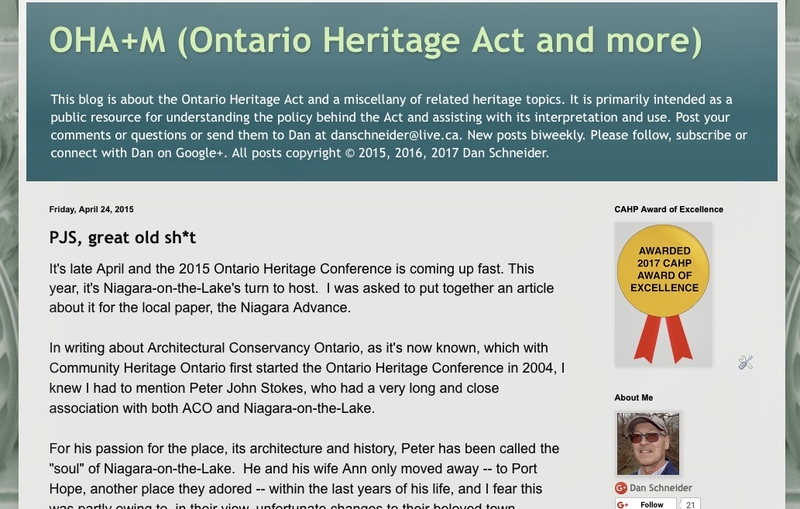 2015 marked the 40th anniversary of the passage of the Ontario Heritage Act in 1975 and the 10th anniversary of comprehensive amendments to the Act in 2005. As former senior policy advisor with the Ontario culture ministry and the lead policy expert on the 2005 changes, I wanted to write a behind-the-scenes account of the province’s long and tortuous path to stronger heritage legislation over the 30 years between. But there were few forums for an article of this type. Existing publications tended to be discipline-specific and limited in their scope and reach. The name OHA+M highlights the focus on legislation, public policy, and tribunal decisions. But over the last two and a half years the blog has evolved into something more. Besides the main fare, it is (now and then) a bit of a bully pulpit. Sometimes it vaunts my favourite places and subjects (ruins, por exemplo). Often posts are imbued with personal recollections. One of my favourites is a tribute to conservation pioneer Peter Stokes. New posts to OHA+M get cranked out every two-three weeks — and, with this one, number 68 in all! Considering that posts are usually 1000+ words in length, that’s a lot of blah-blah. OHA+M now consistently attracts 400-500 pageviews a month. While information is limited and largely anecdotal, the readership (this means you) appears to be mainly those with a professional interest — consultants, heritage planners, heritage educators — and members of volunteer organizations — municipal heritage committees, Architectural Conservancy Ontario members. “WOW - another super article from your blog. Great to see the Gore Park reference so I am forwarding it to all the heritage groups in Hamilton — Friends of the Gore, Heritage Hamilton, HeritageWatchHamilton, etc — and it should go to the Councillors.” Carol Priamo, Hamilton, on a post about a redevelopment project on Gore Park. “Great update Dan, thanks for your diligence. I especially liked the quotes from parliamentarians on all sides.” Amy Calder, Vancouver, BC, on a post about Bill C-323. providing an on-line forum for stimulating discussion of current heritage policy and issues. But thanks to more very good news, help with these things is on the way! Another drum roll. 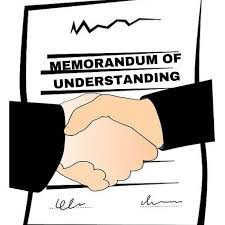 I am very happy to announce that I have signed a Memorandum of Understanding with the Heritage Resources Centre at the University of Waterloo for the hosting of the blog. The transfer of the blog to the HRC website is tentatively scheduled for early 2018. From my end, collaboration with the HRC will bring the blog heightened awareness and attention, not to mention a better, more interactive blog platform, greater outreach including social media promotion by the HRC, and even assistance with research by UW students. Looking ahead, the association may assist both sides in exploring potential public and private sector funding sources to help sustain and expand the blog. The commitment of the Heritage Resources Centre to house, manage and promote OHA+M marks a major turning point for the blog. You’ll be hearing more about this soon. But without you, dear reader, none of this would be happening. 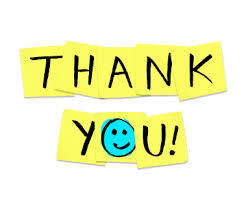 I don’t say it enough: thanks for reading!